The Sydney Morning Herald, 26 August 2010. 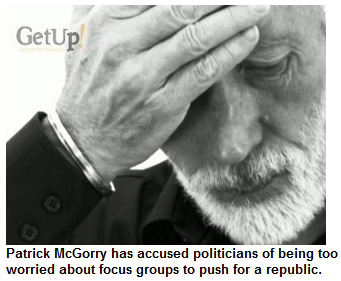 Australian of the Year Patrick McGorry says the nation′s political leaders are too worried about focus groups to push for a republic. Professor McGorry compared Australia with a 27-year-old who just wouldn′t leave home. For this predicament, he blames the politicians. "Like so many other national priorities, the republic has no real champions," Prof McGorry told the annual National Republican Lecture in Canberra. "Leaders will not promote the issue of the republic, nor other issues of principle for fear of offending the focus groups, so where will the momentum come from?" Prof McGorry said cutting ties with the British monarchy was the only way to achieve true reconciliation with indigenous people. "While the apology may have facilitated some resolution of the many atrocities and humiliations committed during the course of colonisation, it is hard to see how the unextinguished claims of the Aboriginal peoples to sovereignty of this country can be responded to while the Union Jack still has pride of place on our flag and the Queen of England is head of state," he said. A hung parliament was the result of politicians "misreading" the people′s deeper needs and desires. "We now see these aspirations being projected on to a small band of independent MPs," Prof McGorry said. Prime Minister Julia Gillard said during the election campaign a republican push should wait until the Queen died while Opposition Leader Tony Abbott is an avowed monarchist.